"Anthropodermic bibliopegy", the art of binding books in human skin, has always excited a macabre interest, and the French are often said to have been particular exponents. A handful of bindings, with highly variable claims to authenticity, are scattered in libraries and museums around the world, but until recently there has been no reliable way to verify them. The "Anthropodermic Book Project", based in the States, has now come up with the science to put them to the test. The technique, called Peptide mass fingerprinting (PMF), makes it possible to distinguish between different mammalian species (including humans) using very small samples of collagen-based materials such as leather or parchment. So far (as of August 2017) the team has identified forty-eight potential bindings and tested thirty-two, of which eighteen - just over half - have been verified as genuine human skin. The real ones are mostly 19th-century and are usually very specific novelty items. This tome, held by the University of Memphis Libraries, is a copy of L’Idolatrie Huguenote by the Jesuit Louis Richeome, published in Lyon 1608. It was originally bought by a Memphis cotton merchant Berry Brooks, in antiquarian bookshop in Paris on the understanding that it was bound in human skin, presumably that of an unfortunate Protestant. It was acquired by UML in 1986. Tested by Dan Kirby of the Anthropodermic Book Project in 2015; verdict: "Sheepskin". 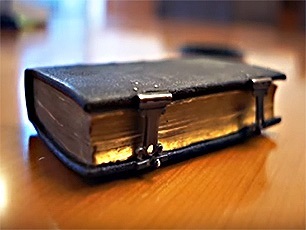 This little book, which once belonged to Louis XIV's librarian, the abbé Bignon, was said by the bibliophile JimThompson to be the earliest authentic example of an anthropodermic binding. It is a copy of Relation des mouvemens de la ville de Messine printed in 1675, containing a manuscript.note "À la Bibliothèque de M. Bignon. Reliure en peau humaine" It is now in UCLA Library. In 2017 Dan Kirby was invited to put it to the test; the verdict? "Sheepskin". 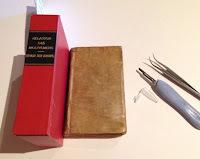 Perhaps more interesting than our now definitive answer to the species of bookbinding material for this book, is the question of why anyone would ever write in the first page of their book that it was bound in human skin. Romantic, macabre, increase the market value? 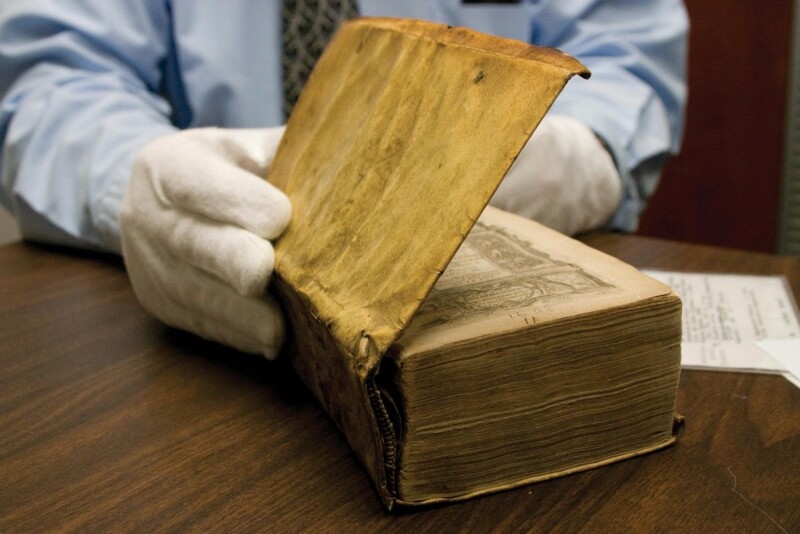 Some books in other libraries have revealed, after testing, to indeed be bound in human skin -- clearly our curiosity about this uncommon bookbinding practice remains. Consuela Metzger, "Human skin binding at UCLA?" UCLA Library blog, 20.03.2017. This 17th-century prayerbook, in the Bancroft Library, UC Berkeley, was reported to have been bound during the Revolution in the skin of a guillotined priest. It was tested in December 2015. This one wasn't real either: the catalogue entry has now been amended to read: "bound in horsehide, resembling black pebble-grained morocco". 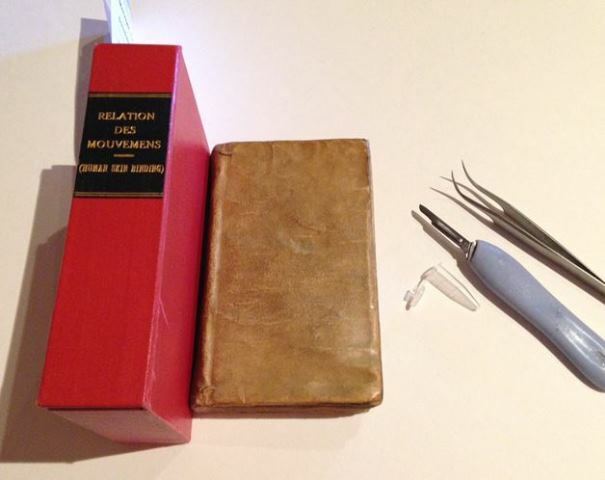 The book in question, a tiny copy of the Jacobin Constitution, printed in Dijon, chez Causse was (and still is) the central piece of evidence supporting the existence of a tannery of human skin at Meudon during the Terror. It was originally in the collection of Guillaume de Villenave. After several sales, it was purchased by the Carnavalet in 1889 from the estate of the marquis de Turgot; it is accompanied by a manuscript note indicating that the binding is of human skin; the museum's register also identifies it as the"famous binding in duodecimo having belonged to Villenave and passing for human skin imitating calf". Its authenticity was said to have been verified by a certain doctor Robin. The book doesn't feature in the Carnavalet's online collections - possibly because it is in the library rather than the museum - but it is still there: Megan Rosenbloom, a librarian at the University of Southern California and a member of the Anthropodermic Book Project, saw it in 2016 and described it as bound in a rich, deep camel brown leather, with gold tooling and marbled endpapers. She reported that the Project was hoping to negotiate access. A copy of the abbé Nollet's Essai sur l'electricité des corps (1746) in possession of the library of Macon, which according to an old note was bound in human skin. This skin was said to be "without grain....extraordinarily fine and lightly soapy to the touch". A set of the 1765 edition of the Encyclopédie, said by the Courier bound in human skin in 1793:"This kind of binding was widely used; there were factories where human skin was tanned absolutely like the leather of cattle or horses, and handsome volumes were made from it which sold at insane prices" (both referred to in ICC 1910-12, p.771).